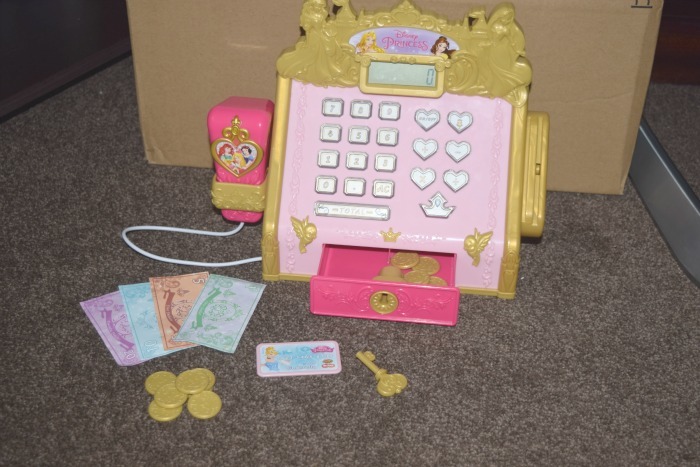 Last week, the kids received the Disney Princess Royal Boutique Cash Register to review. We opened it up straight away as they were so excited to try it out. The Disney Princess Royal Boutique Cash Register has a fully functioning calculator, a beeping hand scanner, a credit card swipe, a cash drawer that pops open and it comes with credit card, paper money and coins. 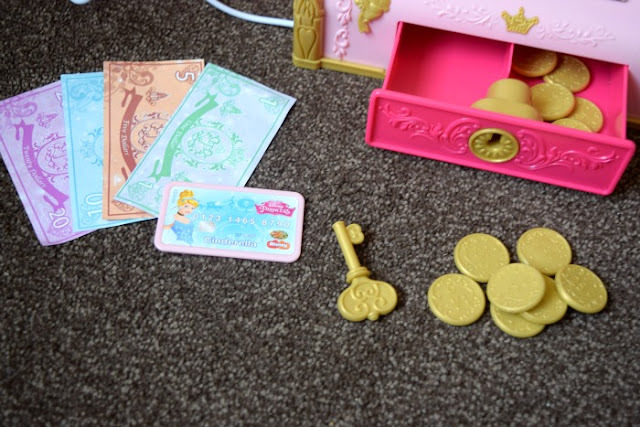 It also comes with two keys as the cash register drawer is lockable, a great feature if your child has younger siblings you want to keep away from the coins and also the fact there is two means you can store one away when the inevitable happens and the key gets lost. 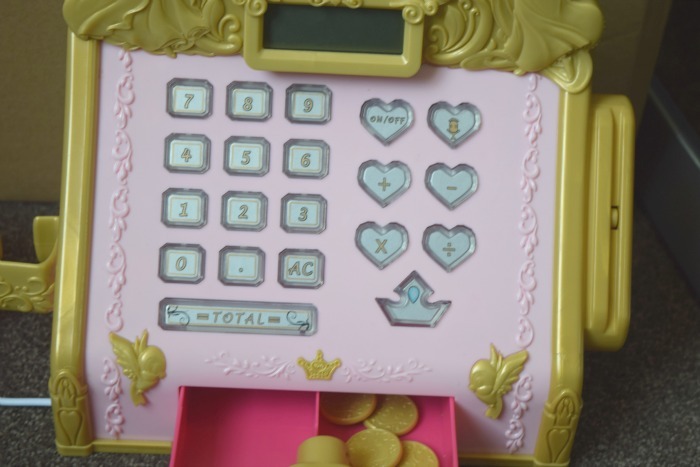 The Disney Princess Royal Boutique Cash Register is a great way to introduce maths and to teach your child the concept of money. I know my kids tend to not understand much about where money comes from and if I say 'No, we haven't got any money' they often say you can use my money/ we can go to the bank. This week they have been playing shops and selling very overpriced food and teddy bears to each other. They love the hand scanner and have even fetched food from the kitchen to 'scan' the bar codes. They have made me laugh so much with the credit card as they scan it and say 'oh no it's not working. There must be no money'. I actually thought that the cash register would only appeal to Gracie but Zach loves it just as much and has played with it a lot while Gracie has been at school. The kids love role play toys, our toy kitchen is the most popular toy in our whole house. I really think things like this are great for the imagination. I would say be very careful if you have younger children too. As much as I tell Gracie and Zach to be careful around Elsie, she follows them everywhere and I have found her grabbing at they money a few times and it is a horrible size that she could definitely attempt to eat. I do have to watch closely and make sure they lock the drawer when they have finished as she is quite clever and will copy them to try and open it. I do think the cash register is perfect for kids 3 and over and Gracie and Zach have both loved playing with it every day. I will be using it with Gracie to try and teach her about money and using the calculator to practice her maths skills in a fun way. The Disney Princess Royal Boutique Cash Register requires 3 AAA batteries to run which are already included (I love when they include the batteries and I don't have to steal them out of other toys!) and the cash register has a RRP of £24.99 which I think is excellent and it is worth every penny.